In the more than a decade following the attacks of 9/11, suspicion and animosity toward American Muslims has increased rather than subsided, with pundits and politicians routinely invoking the specter of Islam as a menacing, deeply anti-American force. 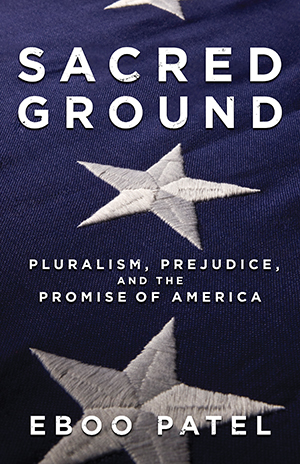 In Sacred Ground, author and renowned interfaith leader Eboo Patel says this prejudice is not just a problem for Muslims but a challenge to the very idea of America. Patel shows us that, throughout history, the forces of pluralism in America have time and again defeated the forces of prejudice, and now a new generation needs to rise up and confront the prejudices of our era. To this end, Patel offers a primer in the art and science of interfaith work, bringing to life the growing body of research on how faith can be a bridge for cooperation rather than a barrier of division, and sharing stories from the frontlines of interfaith activism. Click here to read a blog post on The Wall Street Journal's "India Real Time."